Camp Swift, Bastrop County. Courtesy of Andrew Butler. Image available on the Internet and included in accordance with Title 17 U.S.C. Section 107. CAMP SWIFT. Camp Swift is bordered by U.S. highways 95 and 290 twenty-eight miles east of Austin and seven miles north of Bastrop in Bastrop County. It was built in 1942 on 55,906 acres and initially had 2,750 buildings designed to accommodate 44,000 troops. The camp was named after Eben Swift, a World War I commander and author. During World War II it reached a maximum strength of 90,000 troops and included, at different times, the 95th, 97th, and 102d Infantry divisions, the 10th Mountain Division, the 116th and 120th Tank Destroyer battalions, and the 5th Headquarters, Special Troops, of the Third Army. Swift was the largest army training and transshipment camp in Texas. It also housed 3,865 German prisoners of war. After the war much of the site was returned to former owners. The government retained 11,700 acres as a military reservation. That land housed parts of the Texas National Guard, a medium-security federal prison, and a University of Texas cancer research center. Environmental-impact studies and development plans for the mining of extensive lignite deposits under Camp Swift began in the 1970s. Opposition by environmentalists and former landowners resulted in decades of litigation. 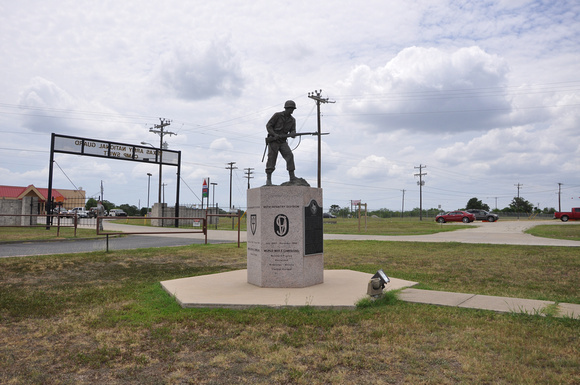 In 1996 the site received a Texas Historical Marker. By 2000 the Formerly Used Defense Sites program (FUDS) was involved in cleanup measures for Camp Swift, and the United States Army Corps of Engineers planned for ordnance removal. In the early 2000s Camp Swift continued to provide training for the Texas Army National Guard. Camp Swift (http://www.globalsecurity.org/military/facility/camp-swift.htm), accessed October 13, 2005. Historical marker files, Texas Historical Commission, Austin. Arnold P. Krammer, "When the Afrika Korps Came to Texas," Southwestern Historical Quarterly 80 (January 1977). Duford W. Skelton and Martha Doty Freeman, A Cultural Resource Inventory and Assessment at Camp Swift, Texas (Texas Archeological Resource Report No. 72, Austin: Texas Archeological Survey, University of Texas at Austin, 1979). Handbook of Texas Online, Art Leatherwood, "CAMP SWIFT," accessed April 21, 2019, http://www.tshaonline.org/handbook/online/articles/qbc27. Uploaded on June 12, 2010. Modified on May 3, 2016. Published by the Texas State Historical Association.